- These LED battery operated string lights are composed of 50 ultra-bright micro LEDs that don’t overheat and energy saving. If one bulb burns out the rest stay lit. - The flexible copper wire can easily build the shapes you want, it is portable and easy to hide and use. - After hours of use, they are completely safe to touch without risk of burns. - The ambiance that they emit is relaxing. The luminosity is 360° sparkle, romantic aesthetic. 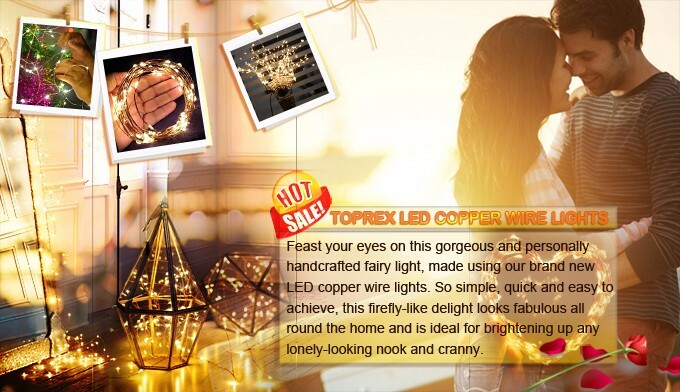 - 3 AA battery powered LED copper fairy lights in a jar are one of the hottest new DIY lighting trends for festival decorations. - Create the appearance of fireflies in a jar with this unique light display that creatively combines a 4.5 voltage warm white battery operated LED fairy lights and a transparent Mason jar. - It can make dynamic and beautiful scenes to add a warm glow to backyard parties and weddings. It is the perfect decoration for Christmas, Valentine‘s Day, event, etc.